Purchasing this item will earn you 915 reward points (Reward Points Rs. 91.50) ! Purchasing this item will earn you 915 Rewards points (Rs. 91.50) ! 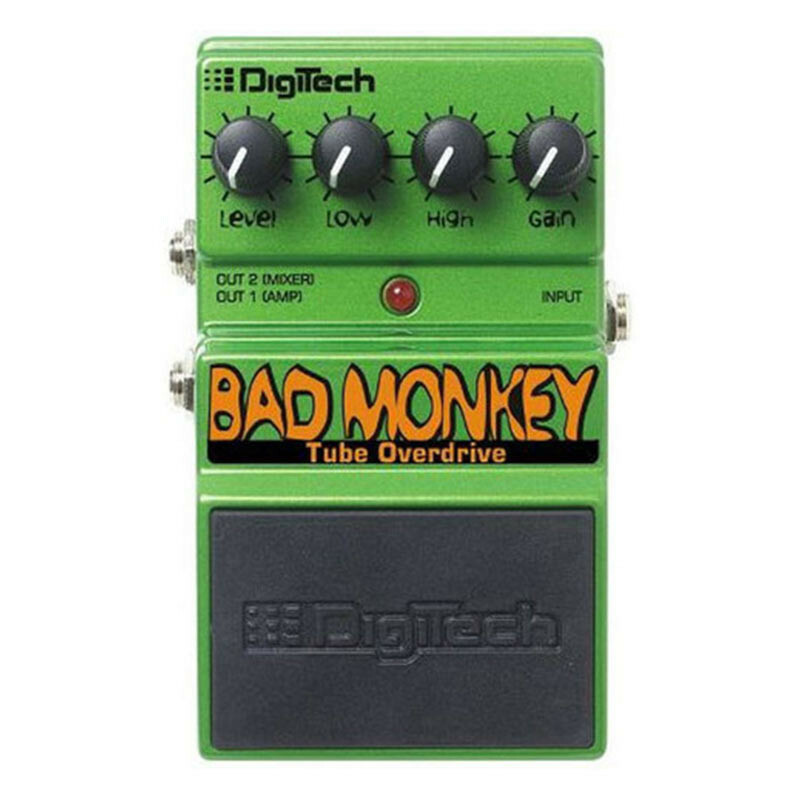 The DigiTech Bad Monkey Tube Overdrive Pedal gives your amp a boost right where you need it, sending your signal from clean to smooth, classic overdrive with character and dynamics. Low and High tone controls give you the flexibility to boost or cut the bass and treble frequencies for just the right sound. The Level knob boosts the output level of your signal, and the Gain knob controls the level of overdrive distortion. The Amp output runs into the input of your amplifier and the dedicated Mixer output has a cabinet emulation circuit that lets you run direct into a mixer or recorder when you don't want to lug your amp along. Output : 2 x 1/4"
Ever since guitar effects pedals first became a thing, guitar as an instrument changed completely. No longer were you limited to just one type of sound. On the contrary, with effects pedals, the sky is pretty much the limit. However, there are things you need to consider when using these devices. Every pedalboard that contains more than two pedals needs to have a defined order. Actually, it is recommended that you pay attention to the order of pedals even if you only have two on there. This whole issue is going to be the topic of our discussion today, so if you're planning on build a pedalboard, stay with us. Why Does The Order Of Guitar Effects Pedals Matter? Guitar effects pedals come in a wide range of flavors. Different pedals alter the signal in different ways, which means that they can come into conflict depending on their nature. A conflict between two or more effects pedals is bound to ruin your tone. With that said, there are numerous effect pedal layouts out there and you won't really find the 'best' one. The order we are going to show you today is a great starting point which you can use to build upon later. Let's dig in. Before we get to 'real' effects pedals, we need to mention tuners. If you have a guitar tuner in form of a pedal, that is the very first thing you want to connect to your guitar. Tuners need raw instrument signal in order to give you proper readings. Wah pedals are most commonly placed at the beginning of the signal chain. The reason for this is the fact that wah pedals boost specific portions of the frequency range, so it is best to feed them with a clean signal from the guitar. Keep in mind that this isn't a rule, but rather a recommendation. There are players who keep the wah-wah later on in the chain. Up next we have distortion, overdrive or fuzz pedals. In general, any kind of pedal that distorts the signal such as the Boss DS-1X or Ibanez TS-9 just to name a few. You want to have them before modulation and especially before temporal pedals like reverb or delays. The reasoning is fairly simple. If you put a distortion/overdrive near the beginning of the chain, the pedal will apply the gain boost to a pretty clean signal. However, if you pass the signal through a chorus, or delay - both of which copy the signal, the pedal will apply the same gain boost to the entire thing. The result will be a mess that is hard to control. Naturally, how true this statement is will depend on the specific brand and model of pedals you are using. However, more often than not, the result will be exactly as we have described above. After the gain pedals, we meet the modulation department. These are your choruses, flangers and similar. As we have already explained, you'd definitely want to have these after distortion or overdrive pedals. Let's take a chorus as an example. This pedal multiplies the signal that is being fed into it and creates an illusion that there is more than one guitar being played. If you feed it a clean signal, that's what it will multiply. Same goes for distorted, high gain signal. Last but not the least, we have temporal pedals. This is where all of your delays, echoes and reverbs come in. The general rule of thumb is to have temporal pedals at the very end of the signal chain. If we look at delays, for example, these pedals copy the signal and release each copy with a certain amount of delay as well as volume correction. Imagine if you've put such a complex pedal at the beginning of the chain and then applied every other effect afterward? It would be pure chaos. Same goes for reverbs and echoes. Other effects pedals such as compressors, level pedals and similar, can be placed in various locations in the signal chain. As a matter of fact, saying that a compressor must go here or there would be a huge mistake on our part. These effects will be pedalboard specific and their placement will depend on the type as well as the number of your pedals. If you search the web, you will find many guides on how to setup your guitar effects pedals. Most of these will claim that their system is the right one and that doing things differently is just wrong. This is as far away from the truth as it gets. Notice how we said that the layout you see above is just our recommendation? The truth is that there is no perfect order of guitar pedals and no single right way to do it. Our layout is a basic one that offers a great foundation you can build upon. The only real way to find a good order of effects pedals for yourself is to experiment and experiment some more. That is literally the only way. Only know which pedals you have and how they work with each other. Sure, there are some suggestions you should stick to, but nothing is really set in stone. As we reach the end of our guide, we’d like to thank you for sticking with us. We hope that you have learned something new today and that this guide gave you enough information to understand the basics of guitar effects signal chains. If you find it difficult to figure out something with the gear you already have, start simple and start slow. Add the pedals one by one until you find the layout that fits. On top of that, many popular guitar players constantly change the order of their guitar effects pedals. In other words, don’t take this as a definitive job, but rather something that evolves over time. The power of screamer- The Ibanez Tube Screamer! The streamer had been impactful since the 80’s and the Ibanez Tube Screamer pedal, for instance, had been recorded one of its kinds. Learn about the impact the screamer had created over the years in the music world…plus, stories of the sensational guitarist as well being told. I wanna talk a bit about voodoo child... yea, like the hundredth time! But this time I am not talking about Jimi Hendrix’s voodoo child but its cover by the legend Stevie Ray Vaughan; a genius musician, singer, songwriter, and record producer. In spite of a short-lived mainstream career spanning seven years, he is widely considered one of the most influential electric guitarists in the history of music, and one of the most important figures in the revival of blues in the 1980s. About that song again; you know what? You may know to sing its lyrics throw the feel and shred the tabs; but I am kinda sure you don’t know how to sound like it! Ha? Gotcha! Anyways enough of show off, Let me tell you how you get that classic sound used by Trey Anastasio (Phish), Gary Clark Jr., The Edge (U2), Noel Gallagher (Oasis), Kim Gordon (Sonic Youth), Buddy Guy, Kirk Hammett (Metallica)... I know it’s pretty long list... Greg Howe, Joan Jett, John Mayer... You still want me to continue? I better tell you the grand solution instead; Its Ibanez tube screamer; better known as Ibanez TS9. Tube Screamer is an overdrive/distortion pedal that is mild compared to many, but allows the true sound of the guitar and player's technique to come through. The most popular use of a tube screamer is to push a tube amp to make it overdrive more, but they sound good through almost anything. In about 1993, Ibanez started to make the TS-9 again due to popular demand. This "reissue" is just about identical to the last "original" TS-9s in sound, circuitry, and appearance. They even used the old manual dated 1981 to confuse us more! The IC chip they use in the reissue is the same as some later original TS-9s, the Toshiba TA75558. 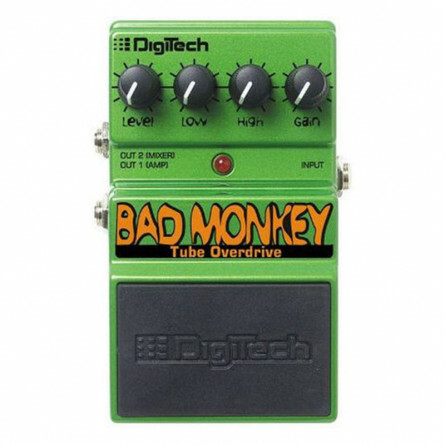 They are a higher tech chip that will work well in higher tech equipment (where you want a low noise op amp) but are not the best for a tube screamer. You can tell an early TS9 by the green coated resistors inside. But 1980 TS808 that has mostly tan coated resistors and a few green ones so they were not consistent. Some late originals used the brown coated resistors also, so check the date codes on the electrolytic can capacitors. In late summer of 1998 the TS9DX Turbo Tube Screamer was made available for those who want more volume, distortion, and low end. It is the same as the TS9 but has an added knob which has four MODE positions. Each position adds low end, increases volume, and actually decreases distortion. Although the circuit design details of the legendary Tube Screamer® overdrive pedal have been extensively analyzed and documented in the past, the key aspect of its design, which is primarily responsible for the signature overdrive sound, has remained unrevealed. This key aspect consists of a subtlety in the clipping circuit employed by the legend. Operational Amplifier based inverting amplifiers with back-to-back diodes in the negative feedback path are common clipping circuits which are regularly utilized in overdrive and distortion effect designs. When the output voltage exceeds the forward-voltage drop of the diodes (about 0.3 V for germanium diodes and 0.5 V for silicon diodes), the diodes turn on gradually and softly clip the output waveform symmetrically as shown in Figure 2. This is exactly what is expected from this circuit. However, when the same circuit is modified so that the input voltage is applied to the noninverting input of the operational amplifier (i.e. the circuit is converted to operational amplifier based noninverting amplifier) something strange happens. It turned out that the output waveform of the noninverting clipper consists of two components: (1) the amplified and clipped version of the input waveform. (2) Plus the unamplified input waveform. That is, the noninverting clipper adds (or mixes) the original input signal to the amplified and clipped input signal. The amplified component is softly clipped at the forward-voltage drop of the diodes, whereas the combined components are clipped hardly at positive and negative supply rails in rail-to-rail operational amplifiers or at a level lower than the positive and negative supply rails in non-rail-to-rail operational amplifiers. Inserting a 47nF capacitor in series with the resistor R1 forms a pre-clipping first-order high-pass filter with a cutoff frequency of 720.484 Hz (R1= 4.7 KΩ). This filter causes phase shift between the unamplified input waveform and its amplified and clipped version, which results in the output of crooked waveform. Mixing the input signal with the output signal of the clipper preserves the original dynamics of the input signal which otherwise would get lost at the threshold of clipping. Preserving original dynamics of the input signal avoids muddiness and vastly improves clarity and responsiveness. This subtle feature constitutes the heart of Tube Screamer®’s legendary sound and feel. Post-clipping equalization circuit contains another subtle detail: the exact cutoff frequency of the first-order high-pass shelving filter is linearly dependent on its gain (i.e. boost/cut gain in dB) parameter (with slightly different slopes for boost and cut segments). This is called progressivity of the parameters and it is an inherent feature of almost all great sounding analogue equalization gear. The pedal was popularized by Stevie Ray Vaughan. Phish guitarist Trey Anastasio implements two TS9 Tube Screamers in his rig. It is widely used in genres as diverse as country, blues and metal. The Tube Screamer has since spawned many clones and modified versions. The Tube Screamer series of distortion/overdrive boxes from Ibanez has a reputation that has led them to pass into musical urban myth. Helped along with Stevie Ray's use of them, the TS 808 and TS 9 have been sought after and traded up to astronomical prices. The other members of the TS family, the TS-10, the TS-5 and the TS-9 reissue have had a more troubled reception. All the members of the TS family share a common technical design, with the similarities vastly overwhelming the differences. The TS series seems to be at its best when driving the input to a tube amplifier - that is, a triode grid connected to ground through a resistance of about 1M. All the TS series are capable of making their own distortion, but by itself, this distortion is much less interesting that what you get into a tube amp input. Processors come packed with loads of sound patches and effects which may actually confuse you for a while, but it will teach you everything related to effects overtime; from how to tweak them to how to control them, I mean everything. Yeah I know! Calm down! This is not a real fight just a comparison…. stand in between and let you decide what is the best or what you prefer. teach you everything related to effects overtime; from how to tweak them to how to control them, I mean everything. of effects rather than its quality. that way; like you buy an expensive delay pedal, and it will handle all your delay related tantrums you throw at it. Multiple operation modes? Check. Diminished unwanted noise? check. Tap tempo control? check. Chorus effect? Check. Control over delay time and feedback amount? Check. Sound with saturation, warbles and flutter; Check-Check-Check. cost you around 20,000 rupees! Fits in my budget and my requirements? Is it simplistic? So that I can do last minute changes on stage (if so). And lastly is it too flashy or too dull? Now those are basic priorities. If you go in depth there would be hundreds of them, but these points generally sum it up. 1. Does it fit my budget and my requirements? EQ, noise gates etc are all set. You just need some effects and you are good to go. Now, what kind of musician are you? What kind of effects you actually need? Let’s say you are an acoustic guitarist; singer-songwriter, all you need is reverb! And chorus (if you want to keep it fancy). Effects like Delay, looper, flanger, vibrato, Phaser, fuzz/overdrive etc is optional. Distortion is useless for you whatsoever. Get yourself Boss RV-6 reverb pedal, and you will do awesome. that is enough to demolish the gig venue! you have an audience of at least 300, your digital gear may disappoint you. virtual representation. Go for what suits you the most. hear/see something funny (or paranormal) is happening with your device, it’s better to hand it over to the professionals. simple to edit. Traditional pedals really have no issues in this area, all it has is 3 to 4 knobs and a switch; piece of cake. 5. Too flashy or too dull. So yeah, that’s it guys. I hope you liked it and would be helpful to you.